Imagine that when you buy a car you first select a designer and a master assembler. Parts and materials arrive from different states and countries for on-site fabrication. You're given a probable 6 month date for completion, barring unforeseen conditions and Force majeure. In many ways building buildings has changed little for centuries. Most often, workers at job sites build buildings from raw material and individual parts. More than a century ago the great American inventor, Thomas Edison, invented a single-pour system for concrete construction using a house-sized form. He felt these concrete homes with their seamless and integrated construction would revolutionize American life. They would cost little more than a car. They would be fireproof, insect-proof, easy to clean, and never need painting. Edison's concrete home prototype was an early attempt to rationalize the residential construction process. Recent efforts even include 3D printing of entire buildings. Panelization of prefabricated wall panels is now widespread in the single family construction industry. Largely preassembled and fully modular units are also becoming more popular. Such buildings are assembled more as cars are assembled: partially constructed or wholly assembled in a plant, with quality and timing of delivery assured. These can be prefabricated and sometimes even shipped with fully outfitted interiors. A lot of new design thinking is going into projects like these. With larger scale buildings, progress has also been accelerating. Moshe Safdie designed "Habitat '67" for the Montreal World's Fair. Its 158 residences, assembled from various sized concrete shells, were arranged in different combinations to a height of 12 stories. Our own architectural office in Aurora, Illinois, shown here, has grown in tandem with an affiliated company: a largeprecast plant. Together we've pioneered prefabricated construction in the form of "systems buildings": where the structure, floors and major walls are prefabricated and delivered to the job site for rapid assembly. Shown here are component pieces for "systems buildings": wall, floor, and structural parts from which a building shell can be efficiently built. This approach to construction simplifies and speeds construction. Because it creates exterior walls with fewer pieces, there are fewer joints, which also means less future maintenance. Because these components are locally made of recyclable materials, this process is also considered sustainable and can qualify for LEED credits. 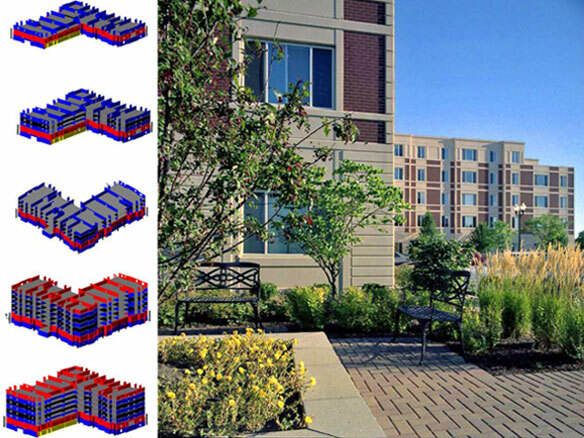 Here are a few different precast residential buildings, including some IHDA projects. These compete in cost with all major construction methods but are more durable, fire resistive, and trouble-free. Unlike Edison's vision for a single pour concrete home, or Safdie's Habitat '67, the precast concrete "systems buildings" shown here are a proven and economically viable construction method. They can provide considerable savings in construction time and dollars, while providing safe, extremely durable, and fire resistant construction and a great deal of design flexibility. Please contact us to learn more about how this type of construction may be applicable to your next project.